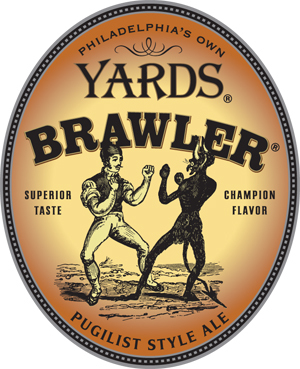 Brawler won a silver medal in the English Mild category at the 2013 Great American Beer Festival. Every so often, you really just want a nice, easy-drinking beer; one that doesn’t destroy your palate; one that quenches your thirst; one you don’t have to think too much about to enjoy—a beer that delivers a lot of flavor but little alcohol punch. That’s what the Brawler is all about. This deep amber-colored English mild falls in the lightweight category, but delivers a malty blow nonetheless. Toffee notes greet the nose with just a hint of earthiness. Flavors follow suit, with a clean, crisp finish, making this a delightful companion with a variety of food. The beer hits the glass looking like maple syrup with a thin tan foam. The aroma is agreeably malty with a nice touch of caramel. On the palate, it’s gently carbonated, dry and brisk, with nice biscuit malt development through the center and a clean dry finish. Looked at objectively, this is a simple light amber ale, bereft of any particular bells and whistles. These days, some may mistake it for a bore. I think it’s actually kind of awesome. It’s juicy, drinkable, lively and “more-ish.” That’s a lot harder to do than you might think. Respect. I think I’d like to have four pints, please. Lisa Morrison, aka the Beer Goddess, talks beer every day at her beer store and taproom, Belmont Station, and on a weekly radio show in her hometown of Portland, OR. Garrett Oliver is the brewmaster of The Brooklyn Brewery, the Editor-in-Chief of The Oxford Companion to Beer, the author of The Brewmaster’s Table, and the veteran host of more than 900 beer dinners in 15 countries.